Disable Facebook Timeline: Back in September Facebook announced several changes to their platform, once of which was a completely redesigned profile page called Facebook Timeline. Facebook Timeline was meant to be a chronological view of your activity on Facebook, or as Facebook would prefer, your life. If you were one of the early adopters who enabled Facebook Timeline but now want to disable Facebook Timeline here’s how. I know everyone complains every time Facebook changes something, and sadly this will be one of those posts as well. My initial reaction to the Facebook Timeline was pretty positive. The newly laid out profile page looked nice, was responsive, and gave your profile a more “me” feel to it. Below is a screenshot of mine after just a little bit of tinkering with the interface. If you’re interested in enabling the Facebook Timeline on your profile you can find instructions on my post How To: Enable Facebook Timeline Profile and What It Looks Like. You have to be a Facebook developer to enable it, but it’s pretty simple if you follow the instructions. The short answer to why would you want to disable Facebook Timeline: it’s half baked. Timeline hasn’t rolled out to all users yet for a reason; and it might not ever be rolled out to everyone. There’s been a lot of noise and requests to disable Facebook Timeline because it reveals so much of your past history on Facebook. It’s odd that Facebook is so willing to display all of your history but won’t let you export everything as neatly, or completely, as Google will. History wasn’t my issue, it was the design. Despite it’s initial appealing visual look, another reason to disable Facebook Timeline is that it’s just flat out difficult to read. The content on your Timeline isn’t always in any sort of logical order, the items flow from left to right in an oddly non-readable way; the usability of Timeline just isn’t there for me. I couldn’t make sense of my Timeline and it was my own content. So for my part, until/if they force it on me, I’ll disable Facebook Timeline for now. UPDATE: It doesn’t appear this method will work anymore! However, I’ve found a way to remove Facebook content automatically. Additionally, my friend Shaan has discovered a way to remove Facebook Timeline in Chrome or FireFox with a user agent trick in your browser. Luckily, disabling Facebook Timeline is even easier than setting it up! To disable Facebook Timeline visit the Facebook Developers App. Then simply select the application you “created” to enable Timeline on the left side of your screen. Once the application is selected click on the “Edit Settings” on the top right hand side under the applications “Settings” section. From that screen simply delete the application. If you were like me, and it took a few tries to get it enabled you might have more than one “application” listed. If these aren’t relevant applications, follow the same procedure and delete each one. 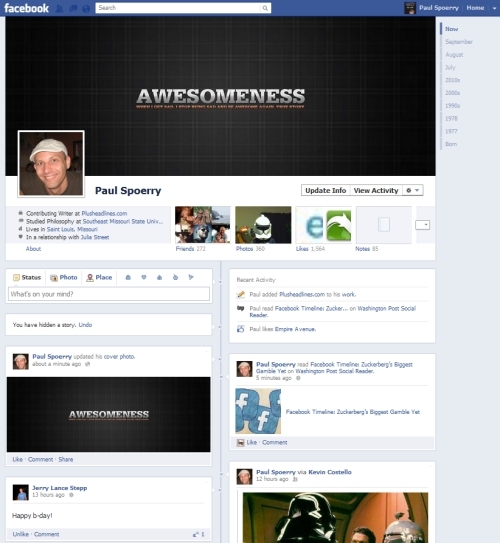 After you’ve gone through the steps to disable Facebook Timeline just hang back a few minutes and visit your profile. You should be greeted with the old school, non-Timeline version of your profile. I disagree with this. Rather than trying to read your profile via the content, you should read it via the TIMELINE. If you trace the posts on your page via the timeline in the middle, you see it’s actually laid out in a very logical order: according to WHEN it was posted. This timeline is only hard to read because we are approaching it the same way we approached the old profile page. However, if you are to realise it’s a different design and approach it as such, it is quite easy to adjust to it. Well, that was really easy! thanks for explaining. I agree with E.G., the Timeline isn’t dificult to read. My reason for disabling the timeline was simply because it felt a bit “lonely” to be the only one using it. Unfortunately this doesn’t help. I came home from dinner and it was changed on it’s on. I had previously tried out the beta version months ago, when users were able to do so. I then deleted the app, deactivated FB, then reactivated. It fixed itself. Now, there is no app for myself to delete, so I cannot change back to “normal” Facebook. I cannot stand the timeline. Have any suggestions? I’m having the same problem as Michelle. I disabled Timeline months ago, only to have it reappear today. But I have zero apps, so no way to delete. Is there another way to disable Timeline? Help! and i have problem with disebling timeline. all app si del but timeline is still there. help! pls! I have the same problem…I deleted the apps, have nothing more to cancel, but the Timeline is still there…How do I make it go away? Help pls! I appears they’ve moved Timeline OUT of beta and made it the default now for all users! If I find a way to revert it back I’ll be sure to share it. its driving me nuts, im having the same problem, i switched it bck to normal months ago and its back again today, i absolutely hate it. i hope someone will find a way of fixing this real soon..
I’m having the same problem. I installed the timeline app a few months ago but shortly after deleted it. I haven’t logged into facebook for a few days but today when I did, I noticed the timeline is back. Hopefully someone will have a solution soon. i am having the same problem. I already deleted the app months ago, and yesterday it re-appeared. I don’t like timeline because it is confusing. and i cannot delete the comment i made to a friend that appears to my wall.. coz in timeline, it does not appear to you but to your friends not using timeline, they can see it. I hope.. someone can teach me how to revert it back please.. thanks alot.. I removed my timeline by deleting the developer app a week ago.. it was back to old facebook page for a week, and now the timeline is BACK. I don’t have anything in the apps either, so why the hell is it back, and how do I get rid of it?? Same here… I removed all the developer stuff and it went away. Then is suddenly reappeared and now I can’t get rid of the Timeline. ARG! If someone figures it out please share it with us. same problem here, i deleted it weeks ago, then it re appeared!, i try to go to the developers page, but there’s no application for me to delete it, pls anyone we need help, i hate timeline! Whatever you do, don’t hide your “Recent Activities” box from the Timeline. If you do, you can’t get it back (at least not yet) AND it stops logging in the Activities Log. If anybody knows how to unhide the darn thing let me know. I would like my Activities Log to actually work. Tnx! hey, your method for deleting facebook timeline doesnt work! @Josh – that does not remove it at all. it only avoids displaying it. And it’s a quick hack, that depends on a bug. A permanent, sanctioned (approved/allowed) solution must be found. I too got raped by the new time line and I hate it. I consider it abuse as it was forced upon us without our consent. Too bad fu**Boooger doesn’t get it that not all of his ideas are brilliant. Probably will close down account and try out google chrome if enough of my friends will also migrate. Hate hate hate the timeline it looks like the juvenile MYSPACE and that was crap too. I think you mean Google+ Tomas7, but yes… I prefer it over FB. LOL at “liberty” who doesn’t include an email address when flaming. Troll.